Can an organic Teddy Bear change the world? With the help of Bears For Humanity, yes it can! What first drew me to want a Bear For Humanity was because I wanted to feel it. I wanted to squish it and hug it and see how cuddly it was. You see they are made with only luxuriously soft 100% certified organic cotton / hemp making them naturally antibacterial and hypoallergenic. Then as I read on, I learned there are an even better reasons you will want your own! First, they are made right here in the USA, giving jobs to those who need one through CalWORKs in Northern California. Moms just like us who need a helping hand. Second, whenever you Buy One bear, they Give One bear to a child in need through one of six charities the company partners with. You pick which one it goes to! In fact, the stuffed animal is personally delivered to a needy veteran’s house, a children’s hospital or an underprivileged household. Third, Bears of Humanity are doing good all over. I read this story that took place earlier this summer with my favorite toy store in Charleston, SC when that awful church shooting took place. I know many of you BeachBums know it too! Lastly, the bears just can’t get any cuter! Choose from 5 colors in 2 different sizes. The biggers bears you can’t help but just want to snuggle in your lap. They have poseable limbs and look adorable sitting in my childhood rocking chair. The smaller bears are non-jointed and P’Diddy has been carrying his around everywhere with him. They come with names (that is Chattie and Sammie above), but ours have new ones – Blueberry and Honey – because that is half the fun when a new stuffed loved one comes home. Watch this video of the two founders and their kids as they talk about what they’re doing, they’re mission and their bears. It’s short and powerful! They are on a mission to change the world, one bear at a time. Visit BearsForHumanity.com for more info or Buy right on Amazon. WIN the organic teddy bear of your choice! I partnerd with Bears for Humanity for this post. All opionions are my own. Amazon link is affiliate. These are adorable & what a great cause! Love companies like this! These are adorable! I love that when you buy one, they give one to a child in need. Love the beige bear. Thank you. How awesome! I would love these for my brand new nephew! OH my gosh! This is so awesome!! I have decided to allow only organic (soft) toys and clothing items as we prepare for our baby, but I have to say that I have been a little disappointed with the selection of plushies available! THIS though, is perfect! Cuddly, cute, and they give back to the world. Love it, thank you for sharing! They are precious and such a good thing, too!! I really like these bears and what they stand for!! I do! So awesome and a wonderful cause! These are very cute cuddly bears that do a lot good for many people. 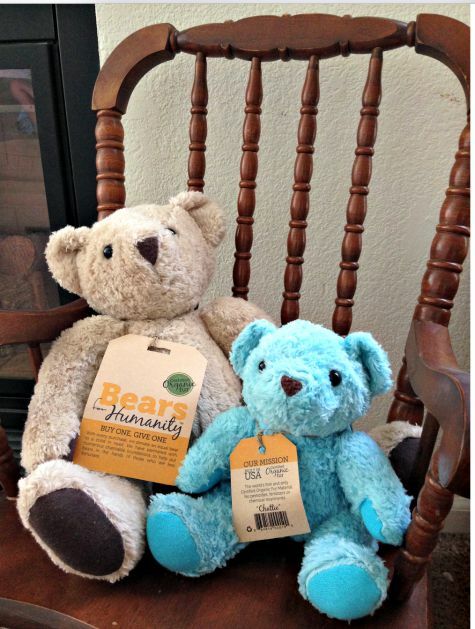 Bears For Humanity would make wonderful birth gifts or birthday gifts for any age. Parent approved for sure! I like all things organic, and to have a special teddy that is organic is awesome. Of course, the humanitarian bonus is amazing, and I would love to tell my daughter that her teddy bear has a twin somewhere with another child. Very fun. This is a good organization. Get one give one is not a new idea, but it benefits so many. I would love to win. I just love all kinds of bears, I will have a hard time deciding on a bear for Humanity, but I will try hard to do so. Thank you for the opportunity. Yes, how refreshing that they are made in the USA. It is getting tough to find sustainable products. Awesome, wouldn't be great if all children had one of these. Yes....the bears are very cute. Yes, Those bears are just so dang cute, adorable and very huggable! I love what they do by donating to well know organizations. They look like beautiful. Bears!! I love that there are so many colors to choose from, as well as the two sizes. Bears for Humanity is such a wonderful idea. I love Bears for Humanity. So adorable and great cause. These are great and I love the colors. Bears for Humanity sounds wonderful, I'd definitely purchase their bears. What a great organization and important gift! Bears have so much meaning and importance to kids, and we all need one. Love this idea and these cute bears. I think these are a wonderful idea and entirely delightful. Yes, they look so cute and soft! These are adorable and I love they donate a bear for every one that is purchased! This is an awesome program! I really do love them!! They do so much for others PLUS what a cute little teddy bear for our own children/grandchildren!! I had never heard of these before. Thank you for sharing. To give a care bear to a child in need wonderful. I would donate to a charity for needy children. I just love that these are organic! I have a nephew that's about to be born, and his mom is very health-conscious, which I think is wonderful! This would be the perfect newborn gift! This are absolutely adorable bears. I think they are so cute! I love that they have them in 2 different sizes and they aren't too expensive especially for being organic! This is a wonderful idea.thanks so very much for sharing this great information. This is a wonderful company, and the bears are absolutely adorable! Thanks for the chance!! These bears are gorgeous and the fact that they are made here in the USA makes it twice as nice. This is such a great thing. Bears are really cute. I definitely love. Thank you for the chance! Amazing giveaway! These are so sweet. My daughter would sleep with her bear and give it kisses. I think it's a great Idea. They may not last as long as nylon and plastic but they are much "cleaner" for us and the environment. OHHH my word they are so soft and squishy looking! LOVE THEM! I think Bears for Humanity is a great idea. Yes, let's change the world one bear at a time. What a wonderful company... Thank you so much for the chance to win a beautiful bear! I love these bears and I know my granddaughter would love it. What a cool idea! They look so soft and cuddly! I love these teddy bears. Great gifts for kids. Bears for Humanity is an awesome idea. This is such a wonderful company to donate with each one purchased. Also love that you can choose which organization gets it from the list My daughter fell in love with Snowie. She loves her blue eyes. Too cute and a great cause too!! So cute! I've never seen a hemp stuffed animal before and now I want one for each of my kiddos! This is soo wonderful. As a child that lived in a shelter, having one small item that is yours can help in many ways. These bears are just the right size too. 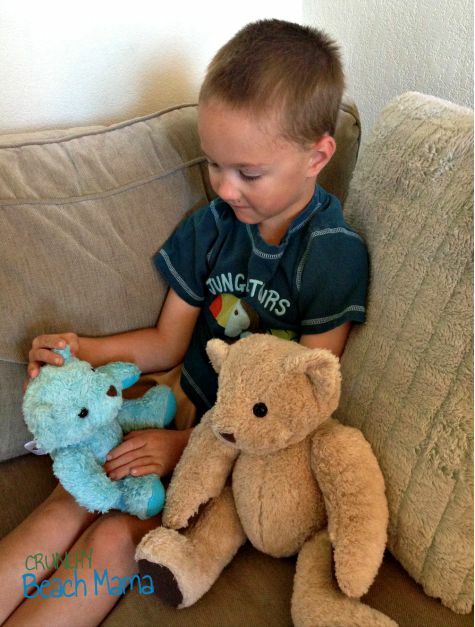 Great cause & teddy bears are timeless! Yes, they're so cute & for a great cause! Wow! What a great post! And what a great company - Love that the purchaser can choose who receives the donation. Thank you for this opportunity! Yes, I absolutely love Bears For Humanity, what an amazing company and cause! I love that all of their bears are made out of 100% organic cotton/hemp blend. I bet they are super soft and cuddly! I love the Bears, I really like that they are giving bears to Veterans, they are so often the forgotten hero's. The bears are so adorable and such a great cause. Thanks for the opportunity to win! I love this idea! I can't find the list of places that I can doate to. This is a great cause I know a sweet little girl would love this bear. I like that the bears are made in the USA, helping to support jobs here! I love this idea! If I win a bear, it's going to the local giving tree at Christmas time. What a great cause. I haven't heard of it before. These look like great quality bears and I love that they have a charitable side to them. Yes, and such cute bears. This is a really great company and I love that they give another teddy to someone in need. I love that they give jobs to Americans and they are organic and safe toys! I really love it! These are adorable teddy bears. I love that they are organic and that the company gives to charity. I love Bears For Humanity. It is a great charity. I love them adorable and knowing that a child in need is also receiving one is precious and is the best gift that can change a child's life and give then love and happiness. Love them! I love their choices of charities and that they are organically made. I love it. They look adorable. My daughter loves her teddies.. I love the bears for humanity. Yes - I think it's great! These bears look so cute! I would love to give one to my daughter! Love Bears for Humanity!! What a wonderful idea!! !